Monday June 10th 1889 It was a nice day for work and we done a lot of it. Washed in the morning and fixed pressed chicken to take to the party tomorrow. Will and I went over town in the afternoon to see Charlie & Ida And they came over here to supper. I baked a cake after they went away and got ready and went to the depot to meet Joe with Will. She came all right and we all went to bed as soon as we got home. Tuesday June 11th 1889 We got around with the work this morning and took in an early start to the birthday party. We had a splendid time. And every body was surprised to see Joe. Wednesday June 12th 1889 I helped iron this mroning and in the afternoon. I felt so wretched that I went to bed. I was up to supper but went to bed early. We did not see any of the folks from town. We hear Ida does not feel well. Charlie went home yesterday. Thursday June 13th 1889 I still feel wretchedly today. I helped some with the work. Hatt & Fan were over awhile in the morning Joe took a ride with Will this morning. 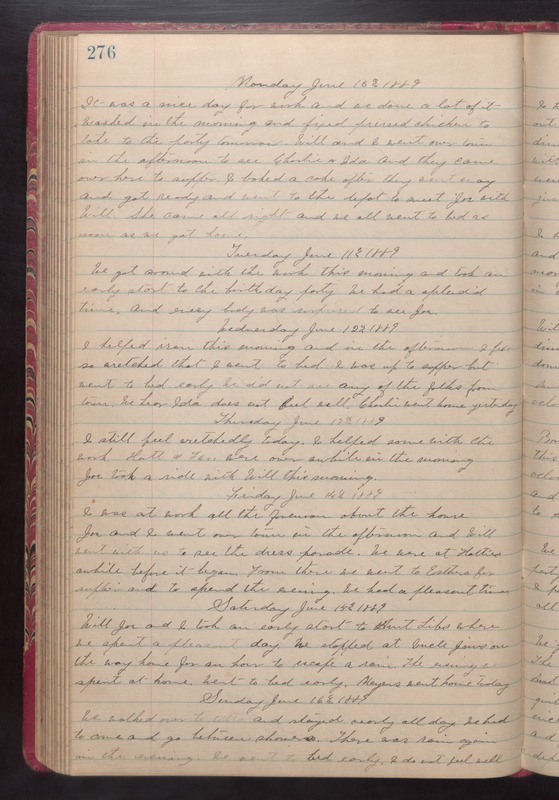 Friday June 14th 1889 I was at work all the forenoon about the house Joe and I went over town in the afternoon and Will went with us to see the dress parade. We were at Hatties awhile before it began. From there we went to Esthers for supper and to spend the evening. We had a pleasant time. Saturday June 15th 1889 Will Joe and I took an early start to Aunt Libs where we spent a pleasant day. We stopped at Uncle Jims on the way home for an hour to escape a rain. The evening was spent at honme. Went to bed early.Meyers went home today. Sunday June 16th 1889 We walked over to Otts and stayed nearly all day. We had to come and go between showers. There was rain again in the evening. We went to bed early, I do not feel well.